It was just too late to change our minds. We had already told too many that we had this fix idea about taking our LiteSport 2X from Norway’s largest lake, Mjøsa, down Norway’s largest river, Glomma, into Salty waters in the Oslo Fjord. So we just had to try, having absolutely no such rowing experience that one might expect. So when did you get this idea? One good friend asked. Three days ago, we said. And you plan to leave in four? Are you crazy? With no training? Well, our thought was that this might be some good training. Maybe ambitious, but there is not much we really do in our modern world that isn’t planed in details. This could be something else. 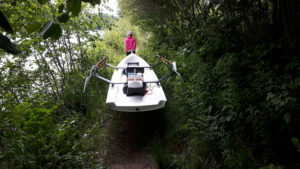 Maybe a small adventure, and to see if it was possible, as we have never heard of anyone else rowing the same distance. At least not since Facebook was invented, and definitely not in the planned three days. How many kilometers, did you say? We didn’t say. We haven’t found out really. 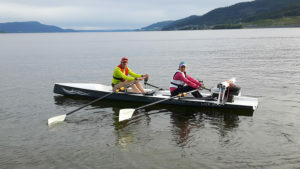 185 km. That’s what Google said, including our seven trolley-trips to get past waterfalls and hydro-power stations. That much. Well, as mentioned: It was too late to change our minds. We got the boat on the car roof and headed of one early Monday morning through the Oslo traffic jam, and an hour later, taking off from Lake Mjøsa down the Vorma River. A cold morning mist surrounded us, and with only the trees to see on both sides, we found ourselves very suddenly in another world. 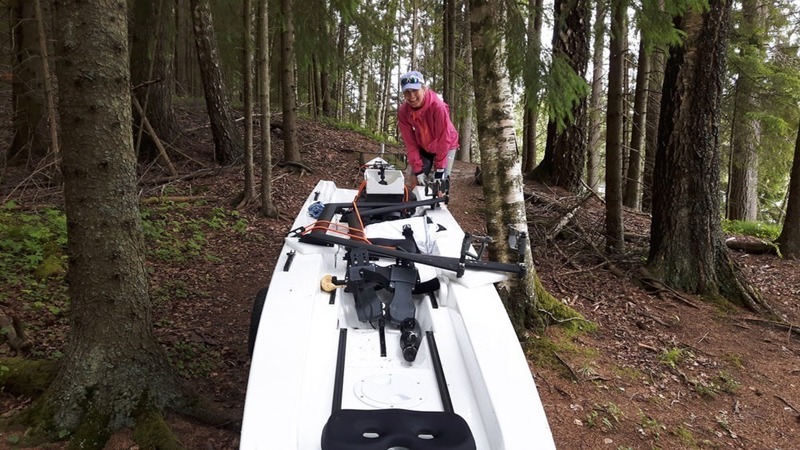 Vorma River is quite narrow, and there is a good current in our direction, so we got some help in the start. 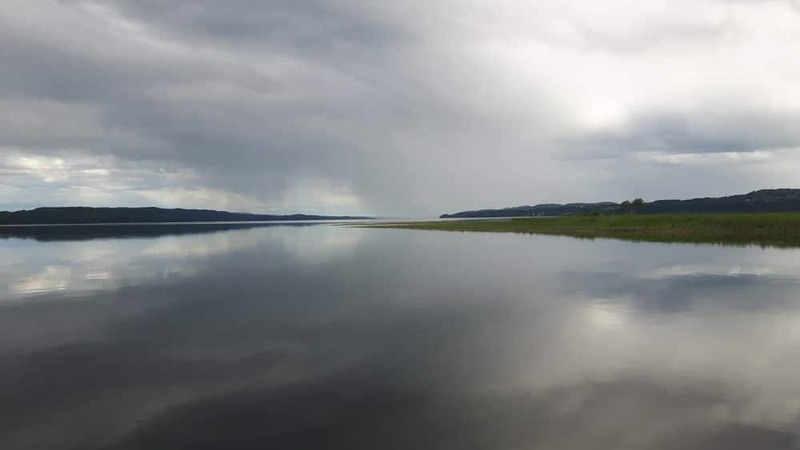 After four hours, the Vorma met the Glomma River. Disappointed that the current reduced dramatically, we could not do anything else than to row on. The Glomma River has many hydro-power stations, with a lot of water going through. On the distance of our trip, we passed 5 medium size stations, with a total installed effect of 600 Megawatts, enough to get quite a few towns up and running on green power. 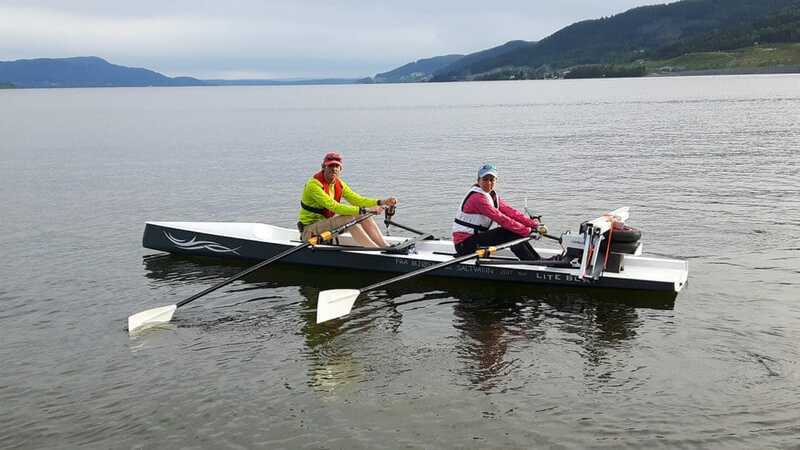 For us, it was of course obstructions in our path, but then again, some nice walks, and rest from rowing. Not always, though. Several places we had to struggle through wilderness, other places around tight street corners in busy towns. 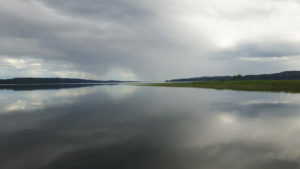 Day one ended in the lake Øyeren, and after some researched we found a comfortable bed with people renting out a room. After 12 hours on rivers and roads, we fainted. What became a surprise was the lack of current in our direction. That really slowed us down, compared to what we had estimated. Also some incredibly boring distances with trees, trees and trees were tiring. But then again, spirits were high every time good things came up, such as clouds diminishing, strange birds flying by and Sissel’s excellent food, prepared in handy porsions. 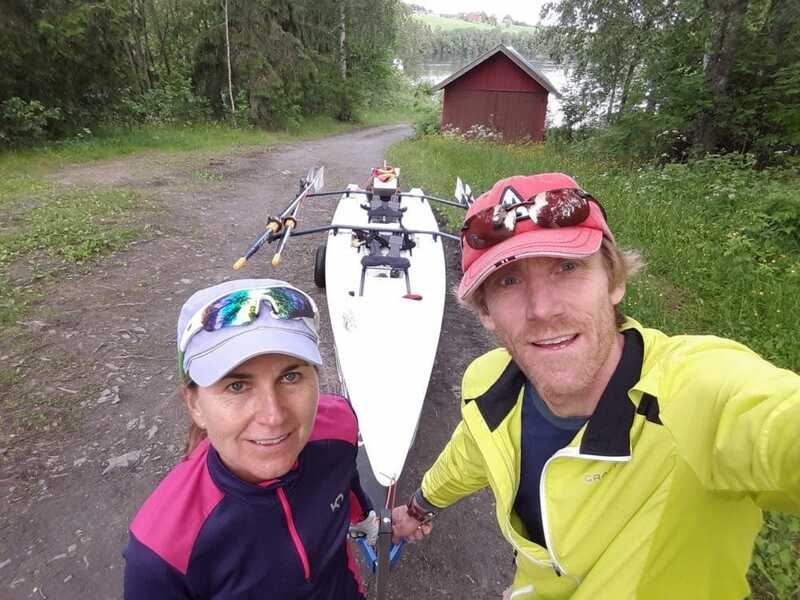 When we got some head wind in the evening the second day, we almost collapsed when finally arriving in the town of Sarpsborg, having thirteen and a half hours at the oars. Sarpsborg has a nice hotel, but we don’t remember much of it, except from a good breakfast. The third and final day, came up sunny and warm. So where are you heading? a farmer asked us, as we passed his tractor on a narrow road. To Salty waters, we said. Well, that’s in THAT direction, you will have enough of it there. So we went, and put our boat in the water for the last time, only 25 kilometers from where the farmer had suggested. 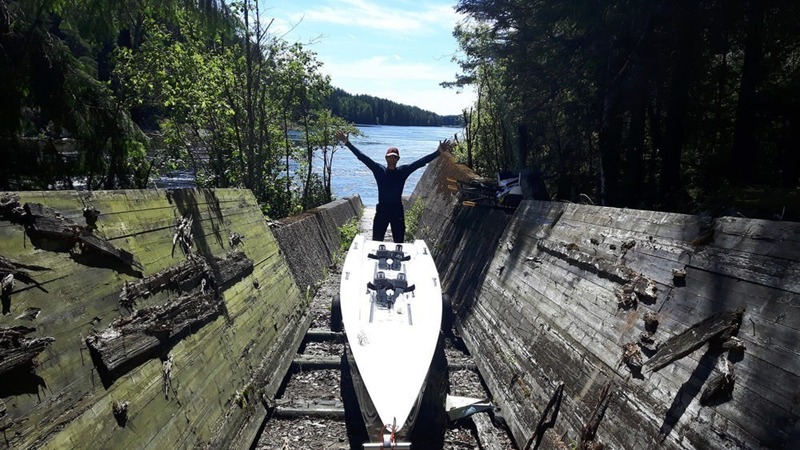 It was our last short leg, and we felt that our goal was within reach, just as we missed a bridge by a few centimeters in a very strong current through the town of Fredrikstad. It could have been bad. But it wasn’t, like so many other things about this trip. What we remember the most? 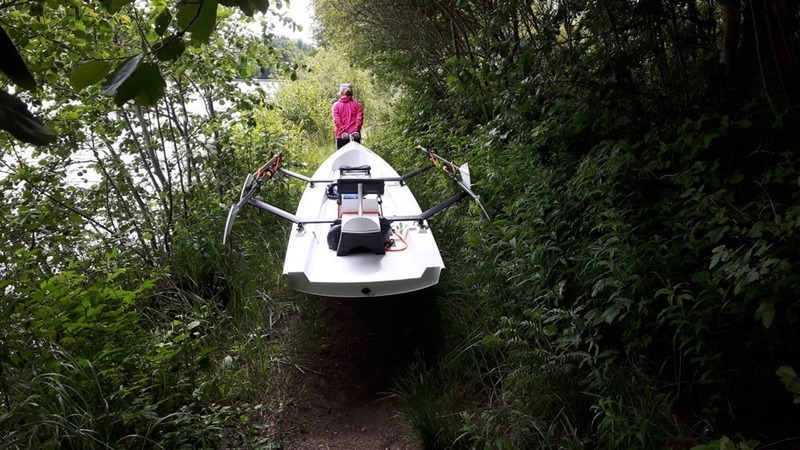 We think it was the last hour, after tasting the some salty water, when we did nothing else than discussing where the our LiteSport 2X will bring us next.